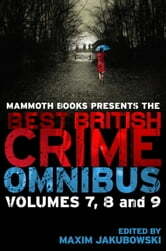 For ten years the Mammoth Best British Crime series has been publishing an annual volume of the most outstanding crime and mystery short fiction published in the UK. Over 400 stories by the very best writers in the field have been published. Contributors have included, among many others, Mark Billingham, Liza Cody, Roger Jon Ellory, Reginald Hill, Peter James, Simon Kernick, Alexander McCall Smith, Val McDermid, John Mortimer, Anne Perry, Ian Rankin, Derek Raymond and Andrew Taylor. 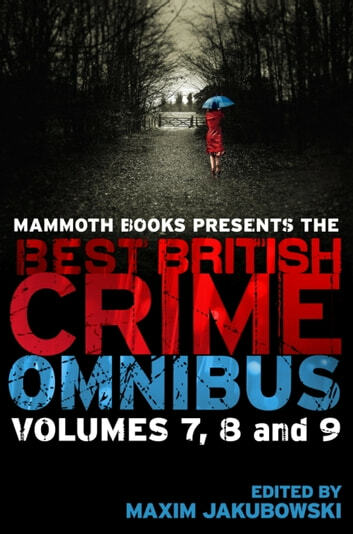 On several occasions, stories published in The Mammoth Book of Best British Crime have won some of the most prestigious awards in the field, including the Crime Writers Association Short Story Dagger, The Mystery Writers of America Edgar award and the Anthony award, while countless others have featured on the respective shortlists. This truly bumper collection of over 120 stories, an omnibus edition of Volumes 7, 8 and 9, showcases as ever the impressive breadth of crime writing, from cosy tales of detection to noir mayhem and psychological suspense and terror. There are puzzles to solve, nagging questions about the nature of the society in which we live, but, above all, there is an abundance of first-class entertainment. Over 1600 pages of outstanding crime fiction by: Lin Anderson, Kate Atkinson, Ian Ayris, Ray Banks, Robert Barnard, Colin Bateman, Mark Billingham, Nigel Bird, Tony Black, Stephen Booth, Paul D. Brazill, Simon Brett, Gerard Brennan, Christopher Brookmyre, Alison Bruce, Ken Bruen, Declan Burke, Col Bury, Tom Cain, Ann Cleeves, Liza Cody, Natasha Cooper, Bernie Crosthwaite, Judith Cutler, Colin Dexter, Martin Edwards, Matthew J. Elliott, Kate Ellis, R. J. Ellory, Chris Ewan, Christopher Fowler, Simon R. Green, Jon Courtenay Grimwood, Allan Guthrie, Sophie Hannah, John Harvey, Mick Herron, David Hewson, Reginald Hill, Matt Hilton, Kate Horsley, Peter James, Paul Johnston, L. Kennedy, Bill Kirton, John Lawton, Simon Levack, Michael Z. Lewin, Toby Litt, Peter Lovesey, Phil Lovesey, Stuart MacBride, Adrian Magson, Barry Maitland, Alexander McCall Smith, Keith McCarthy, Val McDermid, Brian McGilloway, Denise Mina, Steve Mosby, Edward Marston, Amy Myers, Barbara Nadel, Stuart Neville, Christine Poulson, Ian Rankin, Sarah Rayne, Peter Robinson, Nicholas Royle, Zoë Sharp, Roz Southey, Sally Spedding, Jay Stringer, Andrew Taylor, Marilyn Todd, Peter Turnbull, L. C. Tyler, Simon Kernick, Nick Quantrill, Sheila Quigley, Louise Welsh, Marc Werner and Kevin Wignall.